A Chicago man who spent 16 years in prison after being convicted of murder as a teenagerhas been awarded $25 million in damages after it was determined that he was wrongfully convicted. Thaddeus Jimenez, 32, had spent nearly half his life in prison before being exonerated and released in May 2009. After being released, Jimenez then sued the city, accusing the police of ignoring evidence in his case, including a confession from another suspect, Juan Carlos Torres. 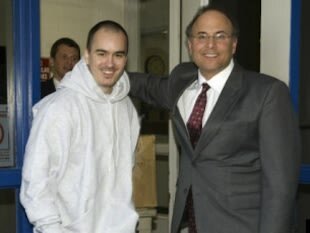 Years later, lawyers and students from the Northwestern University Bluhm Center on Wrongful Convictions and other attorneys reinvestigated Jimenez’s conviction and found that two key witnesses recanted their original claims that he was the gunman. The state’s attorney’s office then agreed to reopen the case. If the verdict stands, it will be one of the largest levied against Chicago in the city’s history. Jimenez is reportedly now working at a restaurant. “He’s trying to figure out what to do for the rest of his life,” Loevy said. However, last December, Jimenez was convicted on drug possession charges and could be headed back to prison for up to three years. He sentencing is scheduled for February 1, according to CBS News. This entry was posted on January 25, 2012 at 10:47 pm and is filed under Uncategorized. You can follow any responses to this entry through the RSS 2.0 feed. You can leave a response, or trackback from your own site.